NewsPlusNotes: Heard On... Cedar Fair's Q1 2017 Earnings Call + 4 New Coasters in 2018? Heard On... Cedar Fair's Q1 2017 Earnings Call + 4 New Coasters in 2018? Cedar Fair has announced their earnings for the first quarter of 2017, a press release for which can be found at this link. The first quarter is always a pretty boring one since most of the parks are closed. 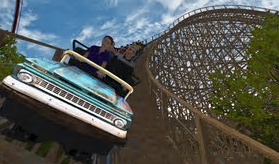 However, this time around the conference call was packed with some very fun news that will interest all, especially coaster fans. Let's take a look. • The first quarter had a shift in when Easter was from last year, so technically results were down. However, when the company considers results through the end of April to net that out, revenues are at a record high of $124 million, up 2%. Guest spending is also up 2% and attendance is comparable to last year. • Knott's Berry Farm had a quiet quarter due to "drought-correcting" rain, but then beat all-time records in April. Kings Dominion has already had their best April in many years and Carowinds posted the strongest spring break week in their history. Mystic Timbers at Kings Island was the best attended ride opening in the park's history. • Season pass revenue is up 10% over last year and more passes are including add-ons such as all season dining, beverage and photo sales. 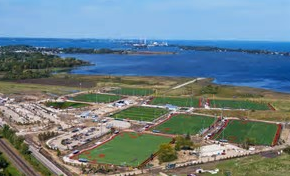 • Sports Force Park at Cedar Point is tracking ahead of the company's first year expectations - off to a great start. The company believes they will finish with more tournament registrations than they expected and many groups are already planning to return in 2018. • Branding studies have been completed for six of the eleven parks. The company attributes much of their recent gains to these studies which help them understand the parks better in order to grow them and gain customer loyalty. For instance, California's Great America is being referred to as the "Bay area's backyard," where family and friends can gather and connect on a regular basis. • All parks will debut a brand new website by the end of the current month. They have a fresh, mobile friendly design that gives Cedar Fair "targeted conversations" with visitors depending on factors such as family dynamics and interests. • Cedar Fair is in the late-stages of negotiations for more Sports Force style developments at other parks. These will also be public/private partnerships, so they take more time to complete. They also just launched two feasibility studies for additional Sports Force developments at two more parks. Sounds like these will be popping up frequently in coming years. • Planning on the future of California's Great America continues "almost daily" at Cedar Fair. They will be finalizing their long term plan toward the end of '17 or early '18 so we will hear more then. Matt Ouimet pointed out that survey markers are already in the ground at the park for something in 2018. • Cedar Fair still isn't ready to reveal which parks will be adding hotels, but noted that they are in the final stages of planning a couple developments with third party hotel chains, saying the plans are with the final development committees of those companies just awaiting the go-ahead. They hope to make announcements by the next call. • Unlike Six Flags' recent news that they will try to operate/buy more parks that can feed to their larger properties, Cedar Fair does not seem themselves going in that direction.